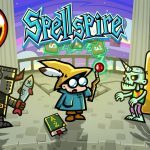 10tons who is the developer behind games such as King Oddball and Tennis in the Face is back again with a new game called Spellspire. 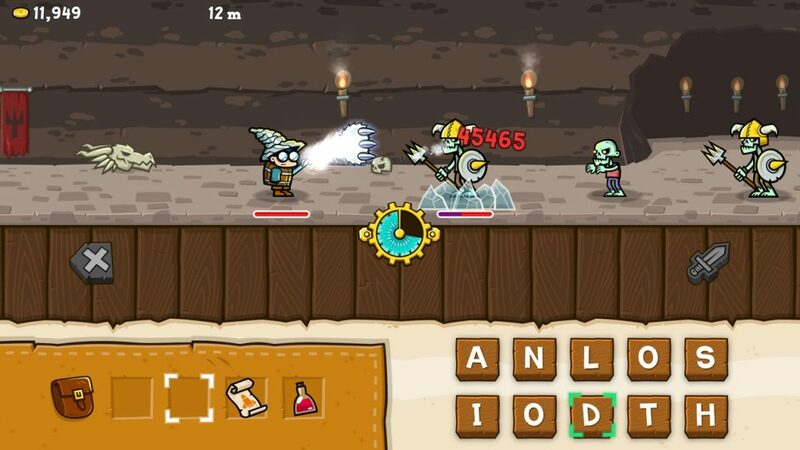 Spellspire is very similar to another game I played on the PS4 called Letter Quest where you basically use letters given to you to build words to attack enemies. 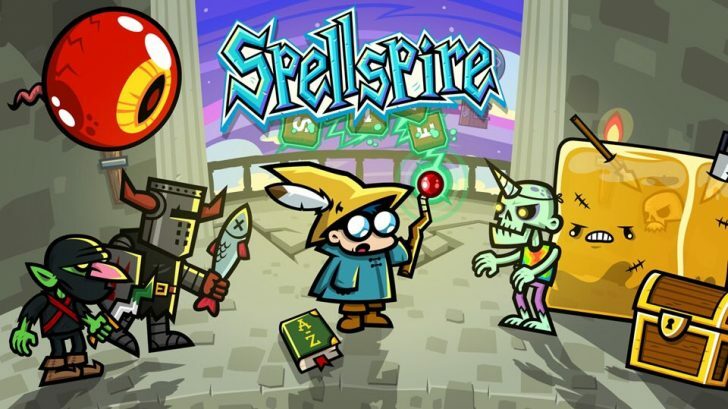 This game is basically the same thing as you play as a cute little wizard and must form words to attack your enemies all the while climbing higher and higher in a 100 floor spire. Each floor of the spire has you fighting different creatures one at a time until you reach a treasure box at the end and can move on to the next floor. To fight the creatures you are given ten random letters at the start of each level and must form as many words with them to attack. Words can be built to be three letter words all the way up to ten letter words with you doing more damage the longer the word is. Unfortunately you can’t use two letter words like is, or, as and so on but they probably wouldn’t do a lot of damage anyway. You also can only use each word once so don’t waste your time trying to use the same word twice. 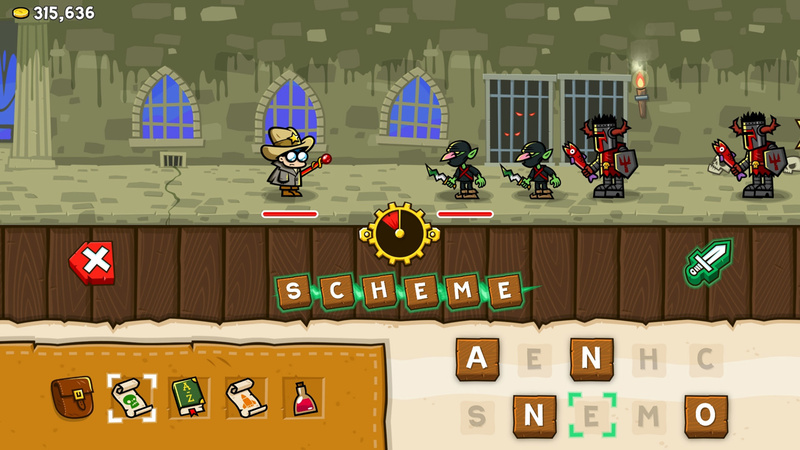 Some enemies have less health than others so a good strategy I found is to use smaller words on the weaker enemies and save the longer words for the stronger ones. Each enemy has a timer that counts down too before they can attack so you want to try and be quick as possible forming words so that you can kill them before they get a chance to make their strike. Some enemies won’t do a lot of damage to you but others can take you out in one hit. 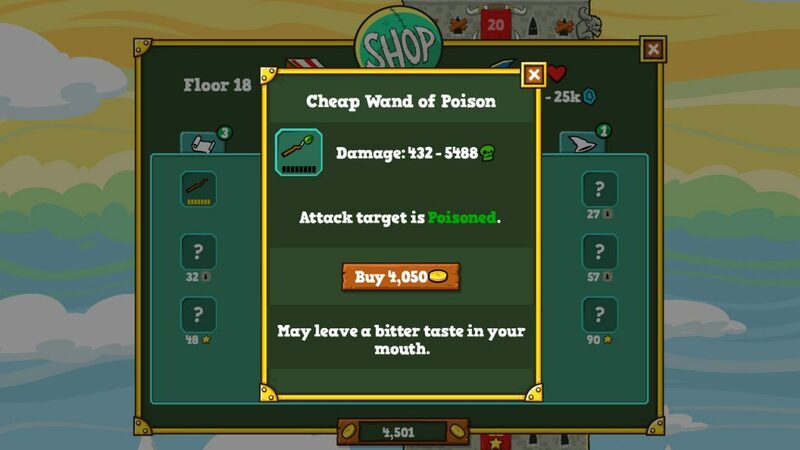 As you defeat enemies or complete floors you will accumulate gold that you can use to upgrade your wizard in the shop. Here you can buy better wands to do more damage or better robes or hats to give you more health as well as other bonuses. You can also use gold to upgrade your base health, weapon damage or each piece of gear. Really though I didn’t find much reason to upgrade any of the wands or robes because you end up unlocking better ones pretty quickly. You can spend gold to upgrade your bag which allows you to hold more one use items at a time. These items can be health potions, spells and other things. There is also a Monsterpedia in the shop that will give you details on all the different enemies you’ve faced in case you need to find out what they are weak/resistant to. As I made my way further and further up the spire I found myself sort of getting bored of the repetition. I was having fun for awhile but by around floor 50 the gameplay was starting to get a little old. There is a boss battle every 10 floors that puts you against a single, powerful enemy which will probably beat you a few times. I had to go and grind a little before I could beat a few of the bosses. Once you beat a level you also have the option to go back and replay it to try and get a star on it. Getting a star requires you to beat it without getting hit once which is further made more challenging by the fact that enemies attack faster than they normally do. Earning stars allows you to unlock other pieces of gear that you can’t unlock by getting to a certain floor. Once you beat the 100th floor you unlock a dungeon that is basically a Survival mode to see how far you can get. The problem is that you just end up doing the same thing here over and over that you did on all 100 floors. Spellspire really could have used some more variation in its gameplay. Another complaint of mine with the game is the fact that the controls don’t work as fast as they should. Typing words just isn’t as fast as it should be and that is because the game was originally on mobile devices where you could just tap the screen. Now you are forced to scroll and pick your letters and good luck if you accidentally type the wrong thing. Many times I ended up losing a level because of how the controls are. On PlayStation the game is Cross-Buy across PS4 and PS Vita and each game even has its own trophy list including a Platinum if you can stick with the game that long. While I’ve seen this kind of word building game on PlayStation before I did enjoy my time with Spellspire at least for awhile. In short bursts it can be fun but if you sit down for any length of time and play through it the lack of gameplay variety will quickly have it feeling stale. *Review copy provided by the publisher. Reviewed on a PS4 Pro.